The US Department of Justice has created a new programme to encourage the career development of young lawyers in the Antitrust Division, naming it after former assistant attorney general James F Rill. For the past several years, conferences, speeches and scholarship have made much of big data – the large, diverse and often anonymised sets of information that can be analysed to reveal trends and patterns. But at the on-the-ground level of active antitrust disputes, the question of access to more old-fashioned kinds of data remains an area of competition law and policy that awaits further resolution by courts and governments. 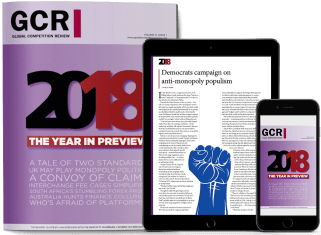 The debate about whether antitrust enforcement should rely on a strict consumer welfare standard or incorporate public interest considerations is not new, but it was reignited in political prominence with the Democratic Party’s summer 2017 call for an overhaul of antitrust enforcement in the US. Complemented by conference panels on the topic from Brussels to Brasília and a Senate hearing to boot, the conversation is back in the spotlight. Last year, the Competition Commission of South Africa accused a host of global banks and their affiliates of colluding on foreign exchange benchmarks. Despite similar probes by the enforcer’s peers around the world, the South African investigation has not exactly gone to plan, having bogged down in a procedural quagmire. Given the matter’s scale and profile, the commission needs to ensure the case does not fall apart. The 34-year-old vertical merger guidelines may not be revised in 2018, but antitrust observers expect that the outcome of the Department of Justice’s challenge to AT&T’s acquisition of Time Warner – along with modern economic analysis – will be included in any future update. It’s difficult to think of many messier European competition litigation stories than the claims for damages brought against Visa and Mastercard in the UK. In her efforts to win a congressional seat in 2018, Lillian Salerno rarely mentions the terms “barrier to entry”, “antitrust” or “competition law” to voters in the suburbs of northeastern Dallas. Will the UK play monopoly politics? Antitrust is ruffling political feathers in the US. Yet across the Atlantic, it receives scant public attention. The first cases to test the UK’s class certification mechanism occurred in 2017, but none achieved certification. This year, the Road Haulage Association will bring the United Kingdom’s third-ever class certification action, a follow-on claim against truck manufacturers found to have participated in a cartel. The competition community is looking for the first case to get the class certification system off the ground. Could the RHA’s be the one to do it? The Australian Competition and Consumer Commission’s current crackdown on the financial services sector will no doubt unveil anticompetitive activity in the market, local antitrust observers say. However, they disagree about how soon this deepened probe will manifest as enforcement actions. Two kinds of people reacted to the Federal Communications Commission’s vote to implement the Restoring Internet Freedom proposal. One kind claimed that the decision was highly irresponsible and would harm consumers significantly. The other kind accused the first group of overreacting to what was simply a return to the pre-2015 status quo. Who’s afraid of online platforms? In 2018, the European Commission may not take concrete decisions about online platforms, but expect it to figure out its position.